Hi All, I mentioned this little project in another thread so to avoid a hijack I thought I'd start a new topic for it. 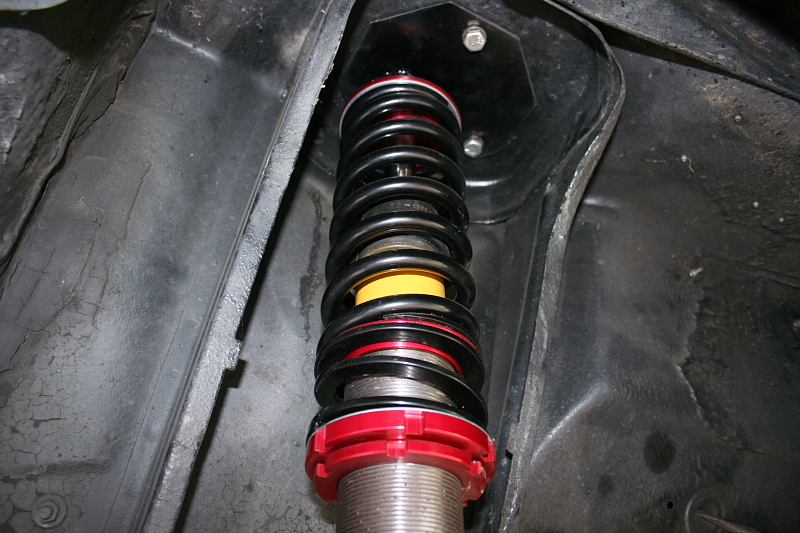 We started with a set of 2ltr struts with Koni adjustable inserts and King springs (220lbs I think). We didn't want to buy new shorter shocks and had limited time to do the job in, so I was determined to come up with a design to keep the standard length struts and shocks. That being said, I think we are on the limit when it comes to having acceptable suspension travel, and making the car any lower would definitely need shorter struts/shocks. 2x Internal circlips, 37mm O.D. 2x 6mm plates, big enough to fill the hole in your inner guard. The drawings show all the parts from Otomoto as well as a very roughly drawn strut (important dimensions are correct though!). The only parts we had to make were the top and bottom spacers, the bearing housing and the housing mounting plate, as well as drill out the top spring mount to suit the shock. We also cut the original bump stop down to about 30mm (in half). On the strut we welded a ring on the outside to hold the threaded spring adjuster tube instead fo welding the tube to the strut directly. The top mounting plates were tack welded together for match drilling and marked for bolt holes from the existing inner guard cutout. Our top plates ended up being octagonal shaped, mainly due to us not having an oxy set to make them nice and round, we just trimmed the corners off instead. This size was just big enough to fit into the lathe and machine out the hole for the bearing housing. Hopefully the drawings explain the setup, ask away if you have any questions. When I have said 'We' in this post, I have meant my father and I. I did all the measuring/design/drawings/part sourcing and he manufactured them. Scott they look pretty similar in design to the set that I have on my car. The only problem that I had was because the bearing is underneath the plate I was unable to lower the car as much as desired. So.... I turned them upside down and now they are depending on the circlip not to punch through!!! This would not be recommended for a rally car and I have to keep an eye on wear in the circlip groove and try not to go crashing over the back of Bill Campbells kerbs too often!!!. If I was going to make another set I would design one with the bearing above the plate. The main reason that I put the bearing under the plate was to be able to get the strut in as far as possible at the top. With the bearing on top, the housing would hit the cutout in the inner guard and limit the amount we could move it. Dad's Mk2 has the small holes which restricts things a bit compared with the amount of room you have in yours. This mod was done with standard length struts also and I didn't have any problems the last time we ran it at MP. With shorter shocks/shortened tubes I don't think it would be a problem going a bit lower. I dunno about relying on the circlip though, but they are pretty strong. The spring seat on my Falcon (on a set of konis) sits on a 'circlip' (looks like a piston ring) that is grooved into the shockie casing. Still going good after more than 10 years use..
Yeah having the big strut holes does help. I can just change the springs through the top in no time at all. Are you doing one of the Sprint series at MP this year? Probably going to do the HRCC TTT day and sprints on the sunday. I think they usually use the full track for the TTT but are only going to use the short front circuit for the sprints. Never done sprints before so this might be a good intro. I've got a lot of work to do around home this year (new shed ), which means I've got to invest the $$ and time here so I probably won't be doing any sprints this year. I'd like to get into the sprints, hopefully I can get all my ducks in a row before next year. There's also a couple of things I need to get done to the tow car before I'm ready to make a weekend away type trip. Nice job have you got any photos of the finished product? And are you willing to share the cad file if so and you email it to me? ozstang65 wrote: Hi All, I mentioned this little project in another thread so to avoid a hijack I thought I'd start a new topic for it. How much compression travel do u have @ ride height, now ? The inserts allow 5 inches travel. Needs to be in middle of that. U need more than double that Castor. U only need 8 inch springs, other wise your carrying around useless weight. 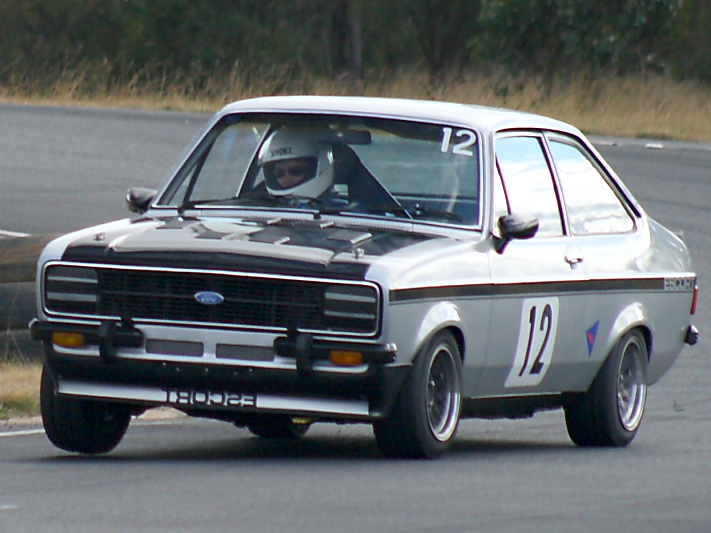 Dont try and lower car too much, ull run into bump steer issues at the rear. Last edited by Roger Miller on Fri Jan 29, 2010 7:04 pm, edited 1 time in total. I used 5mm steel plate. Note the spacers a friend turned up. they allow twice the angle. However that's not a concern, as the inner wing works out pretty close to 90 degrees, when installed. I used 1.6MM ? [from memory] tube approx 20mm long, then cut up 2 more @ 5mm long and cut open to suit id of longer bit. These were edge welded inside 20mm long tube to act as bearing retainers. Bearing assembly was then welded at 3 positions to plate. Zero problems with this in god knows how long. I wanted to retain spring top perches at top of strutt, so there was a step in RX Koni inserts, so they stay there. A small amount of relieving was needed on perch to allow angular difference in suspension travel. I now have tender springs, so dont get a bang everytime it comes off jacks. Last edited by Roger Miller on Fri Jan 29, 2010 10:58 pm, edited 1 time in total. ....................If I was going to make another set I would design one with the bearing above the plate. Can the plate bolt on top of inner guard ? Roger Miller wrote: How much compression travel do u have @ ride height, now ? Theoretically 64mm of droop and 35 compression before it gets to the bump stop. This is with standard Mk2 length struts and standard length shocks. Like I said, I feel it's current ride height would be absoute minimum with this setup. It's not a full performance setup, it's another step in the development of the car. For a relatively low cost, it's been the best performance mod that I've noticed while driving the car. Roger Miller wrote: The inserts allow 5 inches travel. Needs to be in middle of that. The original shocks have a touch over 6 inches of travel. Ideally half way is a good starting point, this setup doesn't really allow for that. Roger Miller wrote: U need more than double that Castor. More castor would be better, but remember that this is a Mk2 with the much smaller than the Mk1 holes in the inner guards so big movement at the top isn't readily available. We are limited by what Ford has given us and what dad is prepared to to with his car. Roger Miller wrote: U only need 8 inch springs, other wise your carrying around useless weight. Roger Miller wrote: Dont try and lower car too much, ull run into bump steer issues at the rear. Rear end in this car is reverse eye springs and Konis, nothing else yet. Motor is strong and very reliable but nothing over the top. Brakes are standard with braided lines and better pads, even got the booster still. 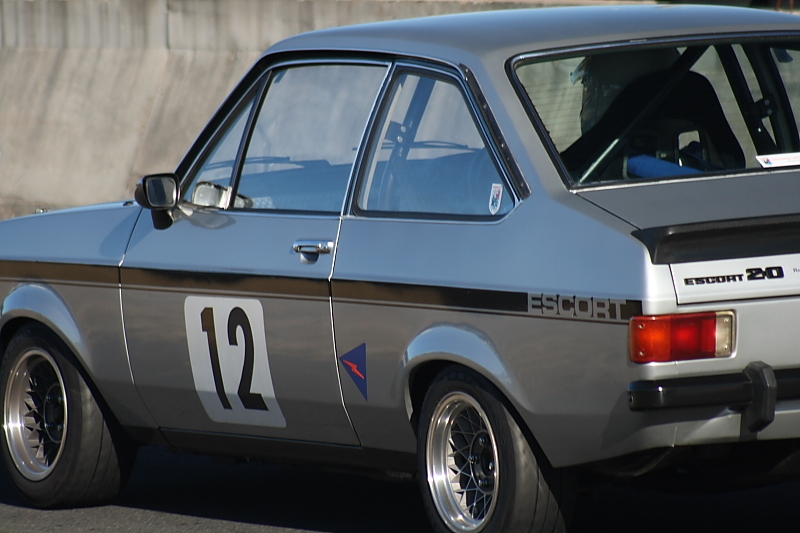 Solid disc fronts and biscuit tins on the back. Front end has the mods as listed above, standard sway bar and lower control arms with the inner mounts moved up and out. Best lap time on the long track has been 1:17.86, keeps getting better each time I run it there. Next thing I want to upgrade is the brakes as after a couple of laps they make me lose a bit of confidence. I just checked, they are 8" free length. 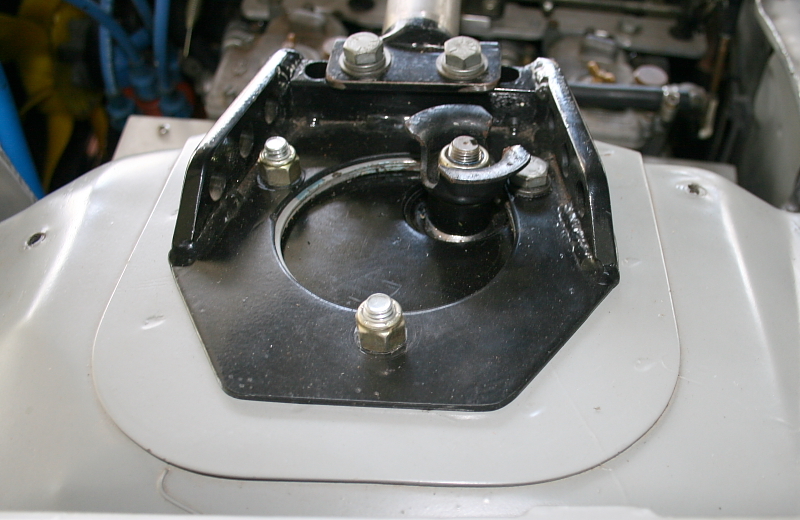 Roger Miller wrote: Can the plate bolt on top of inner guard ? I suppose that would depend if the rules allowed it. You'd probably need bigger bolts and a thicker top plate to take the loads. You could bolt the plate on top of the guard but it would then need nuts to hold it in place, making it a pain in the arse to change springs!! And the strut brace is staying. What makes you say it's a waste of time Rog ? My car is not particularly low (125mm from centre of crossmember) but with the bearings underneath the guards I had nowhere enough bump travel. What makes you say it's a waste of time Rog ? Because in compression it will bend the brackets @ the inner guard mount. This is acceptable bolt on unit. I will have to think about that and try to keep the image of the Gorilla out of my head!!!! Michael Green made these some time ago. stuart wrote: Nice job have you got any photos of the finished product?.. Finally got around to taking a couple of pics.